I gotta update everyone on our schedule. OK, on Dad’s Day we didn’t do a lot of planning, so it was kind of go-with-the-flow day. It was special though in the way we all spent the day together. Now that I have been reviewing this blog, it’s almost like having an online diary of my/our life. Kinda cool when I think about it. Well, I WILL TRY to update next week. We have another singing/studying gig to attend. I did not update in a few hours becuse internet at home was down for a few days. OK, after Shavout there was a singing gig at the Missouri Veteran’s Home in St. James, MO, I really enjoyed that because it seems that our music really touched their hearts. As it was the day before Memorial Day, and because it was a veteran’s home, we sang the national anthem and some other patriotic songs together. The next day, Memorial Monday, we attended a “Tenth Avenue North” concert in Centralia, courtesy of the “Anchor Festival” being held that day. That was SO COOL!!!! 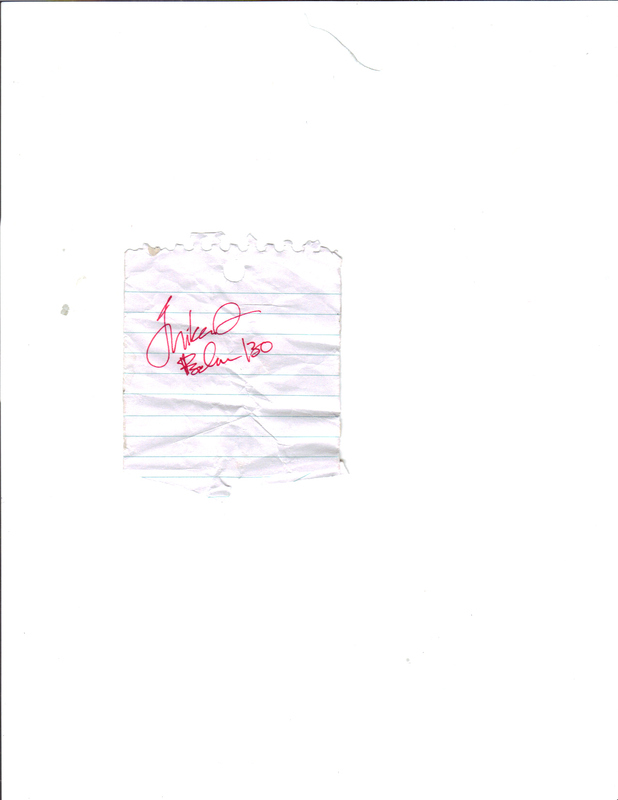 My dad and I even got to meet the lead singer, “Mike Donehey” and acquired his autograph. (see inserted picture) One of the things that I liked about the band, other than their songs, is the fact that they all seemed so humble. When we talked to Mike, it was like talking to a friend you have known for a while. They don’t act all rude and snobbish. After Memorial Day, we had another singing gig at a nursing home in Jefferson City, MO. That was an interesting gig. At first we thought that no one would show up to listen, and then a bunch of people arrived near the end. I’m really glad we got to reach a lot of people with our message. I am sooooo sorry for not updating. When I checked my recent blog post, I realized that I have not updated for around 20-30 days. I have drafts, but they never got up onto the blog. OK, I’ll start from where I left off. After Mother’s Day, the next 3 days were filled with packing, LOT’S of it. If there is one thing I do not like about trips, it is packing. I can never seem to figure what items I should pack, and what I should leave behind. Hey, does anyone have an opinion on the recent oils spill? I don’t really have one, except that I really hope that the well gets capped soon, because a lot of animals are getting affected and it is hurting people along the coasts. I will have another update in a few hours most likely.